Tinkering Studio - National TalentS Co. TalentS collaborated with the iconic Exploratorium in San Francisco to bring the Tinkering Studio to the Middle East as a touring experience. 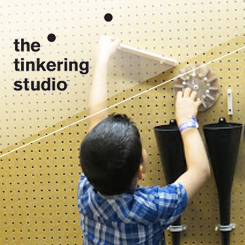 The Tinkering Studio consists of multiple workshops for a playful invention. Audiences are invited to become deeply engaged in an investigation of scientific phenomena, and make something that represents their ideas. Client: K.A.CARE, Saudi Aramco, Sipchem.